Red porgy is a valuable reef fish, used mainly in sushi restaurants, and sold as “tai”. It is caught incidentally by snapper and grouper fishing vessels. Commercial landings of red porgy reached a peak in 1982. This was followed by a drastic decline, and in 2000, landings stabilized due to fishing bans which had been set the previous year. Most red porgy on the market is now supplied by the Gulf of Mexico. 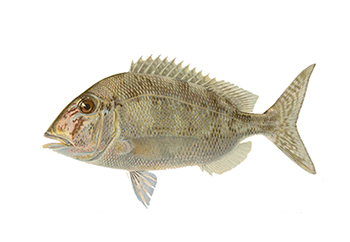 The red porgy’s quick growth and high fecundity make it resilient to fishing pressure. Despite these life history characteristics, the population has been historically overfished and has been reduced to low numbers. Recently, signs of recovery have been observed, although stocks are still not at healthy levels. The status of the red porgy stock is currently well-monitored as both fishery-dependent and fishery-independent data are collected. There are strict management measures in place to help the stock recover. However, these regulations were only implemented once the population was substantially reduced due to overfishing. Since there are limits on the amount of red porgy that fishermen are allowed to keep, surplus individuals are discarded live, but possibly injured and vulnerable to predation in their weakened state. Non-target species are also caught as bycatch including sea bass, grunts, porgies, amberjacks, and sharks. Handlines typically have minimal impacts on the habitat as they do not touch the sea floor. The consequences of removing red porgy from the ecosystem are unknown.